John Linnell was diagnosed with chronic obstructive pulmonary disease (COPD) in 2005. During the following years, he self-navigated many aspects of living with COPD and found himself fully engaged in activities raising disease awareness. 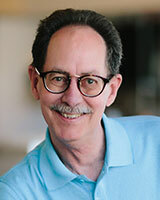 In addition to his volunteer work as a COPD Foundation Wisconsin State Captain, he currently serves on the U.S. COPD Coalition Board of Directors, the COPD PPRN (Patient Powered Research Network) Governing Board and the Executive Board of Trustees for EFFORTS, an international patient-based, patient-driven coalition for those with respiratory diseases. He also assists with COPD research efforts at Johns Hopkins University and the University of Illinois Chicago along with serving on the Department of Defense scientific peer review panel for respiratory health research. He is on the National Institute for Occupational Safety and Health-National Occupation Research Agenda’s (NIOSH-NORA) council for research and recommendations for occupational safety and health. He lives in rural Viroqua, Wisconsin, and is a member of the local health system’s Patient and Family Advisory Council. How did you find the COPD Foundation and decide to become a State Captain? At the time of my COPD diagnosis, I was surprised and disappointed that so little information was available for patients and families. But I said to myself, I have to figure this out. And I did. After spending a career as a district and regional manager in retail and then making a transition to a successful marketing career, I think I was somewhat of “a natural” with networking, connecting, and collaborating with others interested in COPD. At one of the many early meetings I attended after my diagnosis, I met John Walsh, the COPD Foundation’s co-founder and an absolutely amazing man. He got me enthused about the Foundation, patient research participation, and several other things. Next thing I knew, I was on the Hill as a Foundation State Captain, giving my pitch to the offices of my Congressional representatives and Senators in Washington about COPD. State Captains have a really important role in making a difference for this disease. One of John’s [Walsh] dreams was to have a State Captain in each congressional district, 435 in total. We’re not there yet. What are the COPD Foundation’s State Captains? …think of us as a group of individuals who, as a group, have a passion around every aspect of this disease. First of all, know that we’re grassroots volunteers. But also think of us as a group of individuals who, as a group, have a passion around every aspect of this disease. We’re located in all states and one of our main objectives is to spread awareness about COPD. We believe in the importance of promoting facts about this disease and the disease’s impact on family and caregivers. Many of us want to be part of health policy discussions in order that COPD gets the recognition it needs as the killer of Americans this disease is. Though some of us are patients, others are caregivers and family members. We also have several Registered Respiratory Therapists and professionals from other healthcare backgrounds. It’s important to understand that State Captains come from a variety of backgrounds. Why? Because COPD is a disease that is much more than just the patient’s experience. COPD is a family experience, it is a caregiver’s experience, it’s a respiratory therapist’s experience. So mainly we are from those backgrounds. But all of us are involved in some way or another to help bring attention to this disease. Are there important differences between the functions of State Captains located in rural areas versus those who live in urban areas? A State Captain in an urban area may be perfectly suited to meet a rural area’s need and vice versa, so you can consider us as potential partners with skill sets that can cross zip code designations. State Captains do different things, have different interests, and come from different backgrounds. You can find our contact information on the State Captains website. Search by state and then study our bios to match our skills and interests with any need you might have. The COPD Foundation team can also connect you to Captains that match your interests. For example, a Captain who lives in an urban area with an education skill set might be able to accept an invitation to set up a COPD information table at a rural health fair or at a meeting in a rural setting. Another State Captain might be the key individual to engage if a letter-writing or an email campaign is needed to engage policymakers in the rural issues around COPD. You might find another Captain does public speaking about COPD for a variety of audiences, including rural. Other Captains are frequent participants with COPD360Social, the Foundation’s online community. Linnell with other panelists at a recent national rural-focused COPD meeting. 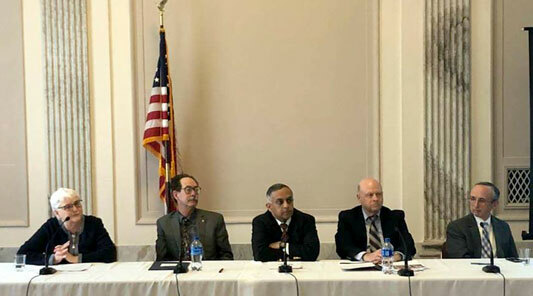 From left to right: Dr. Janet Croft, CDC senior epidemiologist; Linnell; Dr. Akshay Sood, University of New Mexico pulmonologist; Dr. James Kiley, director, NHLBI Division of Lung Diseases; Tom Morris, HRSA associate administrator for Rural Health Policy. I’m another example. My particular expertise as a Captain doesn’t as much link to my rural address as it does to having COPD for some years now. Over time, I’ve become more and more vested in ensuring that COPD research is patient-centric. I’ve been very active in this space and now I’m a co-investigator for patient-centered research. These activities have also given me the opportunity to serve as a patient member of several expert panels for a number of health-related organizations and academic institutions as well as on several COPD-focused boards. I think another important function of my job as a State Captain is making sure I take advantage of any opportunity offered to join those who are meeting with individuals in charge of funding research or who have policymaking roles. I find that a key for engaging these audiences is to speak slowly and to use the startling statistics that describe COPD. I tell them, “COPD is the 4th leading cause of death. It is 155th on the funding list. Don’t you care?” I find those short phrases usually get attention and people start taking notes while listening to our talking points. In May 2017, the National Heart, Lung, and Blood Institute (NHLBI), in official partnership with the CDC, released the COPD National Action Plan. How can State Captains help implement this plan in rural areas? I participated as a patient stakeholder during the CNAP planning meetings. The plan identified 5 stakeholder groups and established 5 goals. State Captains are all in at least one of the stakeholder groups and they can definitely be partners with those trying to implement the plan’s goals in rural areas. Many State Captains might even fit into several stakeholder groups. For example, I’m obviously not a health professional or a policymaker, but as a patient, a State Captain, and as someone very interested in research, I see myself as a member of the other three stakeholder groups: the patient, family, and caregiver group, as well as advocate and research groups. Now that I’ve talked about the variety possible in Captains’ stakeholder groups, I can give you my opinion of where I think our activities match with the goals. State Captains are likely able to provide assistance with implementing the first goal since it’s aligned with what State Captains do: promoting awareness about the prevalence and impact of COPD. For goals 3 and 4, again, we can share research-based factual information and be part of teams that encourage more research. 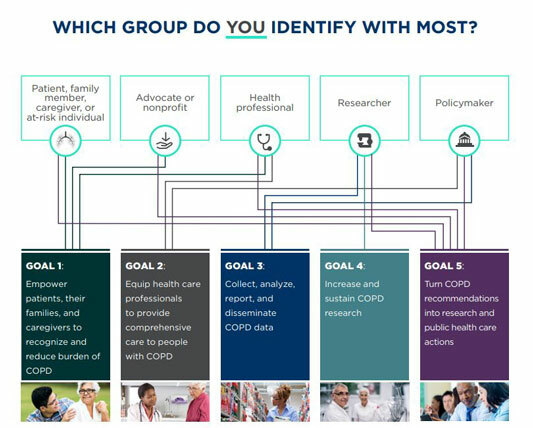 Regarding research activities, just as John Walsh encouraged me, I also encourage others that have COPD to participate in the Patient-Powered Research Network, known as COPD PPRN, a network that is definitely important for rural COPD patients to consider. For goal 5, since it relates to public healthcare actions, I think that goal is another Captains could assist with. You have COPD. After many years in an urban setting, you now live in a rural area. What stands out as the main difference? Access to care. The main difference is access. When I see a pulmonologist, I make a nearly 85-mile round trip. My COPD has been stable and my primary care doctor takes great care of me, so fortunately, I don’t need to see a pulmonologist except once a year. But it’s still a long way to go. And I think my experience is something to highlight because so often the quality of rural care goes unrecognized and underestimated. But I want to share something else that I’ve learned due to a very recent need to access acute care for my health. Because my primary care doctor knows me so well and because we have a nearby Critical Access Hospital, when I became ill, I was able to be cared for locally. It was the first time I was ever in the hospital for my respiratory condition. My stay was short, but I realized I got great patient-centered care right here in my own community. My primary care doctor was great. My nurses were great. I do wonder if I would have gotten that same level of personalized care in a larger facility. Because that’s what every patient should get. Personalized, patient-centered care. That’s really important to me. And I think my experience is something to highlight because so often the quality of rural care goes unrecognized and underestimated. Another access issue is related to peer groups. In rural areas, those geographic distances don’t always allow for groups like the American Lung Association’s Better Breathers Club that includes a group facilitator. Yes, there are many COPD social media groups on Facebook. A great group is COPD360social, the online group sponsored and managed by the COPD Foundation. But there’s something about sitting together face-to-face to share experiences with others who have the same health condition you do that is very important for me. It’s hard to reproduce that experience in rural areas. As a current resident of rural America, what is your great hope for your personal health future or others with COPD? To start, another one-word answer: technology. I have great hope that the remote patient monitoring technology that is being developed will help rural COPD patients — or all COPD patients for that matter — to better self-manage their disease. For example, technology like a wearable vest sensitive enough to detect changes in a patient’s breathing capacity that might trigger a treatment change to avoid a hospitalization. Because there is new technology that offers monitors on our inhaler medications to track our compliance, I think about the potential these devices have to remind us to not only take our medications on a timely basis, but to notify us in advance when it is time for a refill, especially for rural patients who depend on a mailed supply. I even envision a pulse oximeter [a device that measures oxygen saturation] with a remote wireless connection to our oxygen delivery systems that can sense our oxygen needs when those needs change due to our activity level. There are estimates of nearly 14 million people out there in rural and urban America who have COPD that haven’t been diagnosed. We need to find them. But I have another hope. I hope that in the future we’ll do a better job finding others with COPD. At a conference in late 2017, I was on a panel addressing early detection. There was talk about screening patients for COPD during office visits. A physician audience member stepped up and said there just wasn’t time to do that testing. I had to speak up. I told him you have time to get me on the scale and weigh me. You have time to measure my height. You have time to take my temperature. At that time, I didn’t have a heart history, so I said I have no history of heart problems, yet you have time to take my blood pressure. So maybe for people who have COPD risk factors and a cough, maybe we should invest in the low-cost equipment and take the time to screen lung capacity. There are estimates of nearly 14 million people out there in rural and urban America who have COPD that haven’t been diagnosed. We need to find them. This entry was posted in Rural Spotlight Interviews and tagged Access, Chronic respiratory conditions, Critical Access Hospitals, Health conditions, Hospitals, Networking and collaboration, Wisconsin on January 23, 2019 by Kay Miller Temple.